Are you a restaurant owner or operator that hates Yelp? It’s not uncommon. Many restaurant owners feel that they are being held hostage by the site and customers who post reviews on it. No one opens up a restaurant business with a desire to expose their weaknesses to the public and Yelp can act like a magnifying glass to expose the negative moments. I would advocate that you fully embrace Yelp and put more effort into managing than any of your other social networks. But for some operators, they just don’t have the time. Between balancing books, scheduling staff, ordering goods and every other to do list item under the sun, there is just no time left in your day. 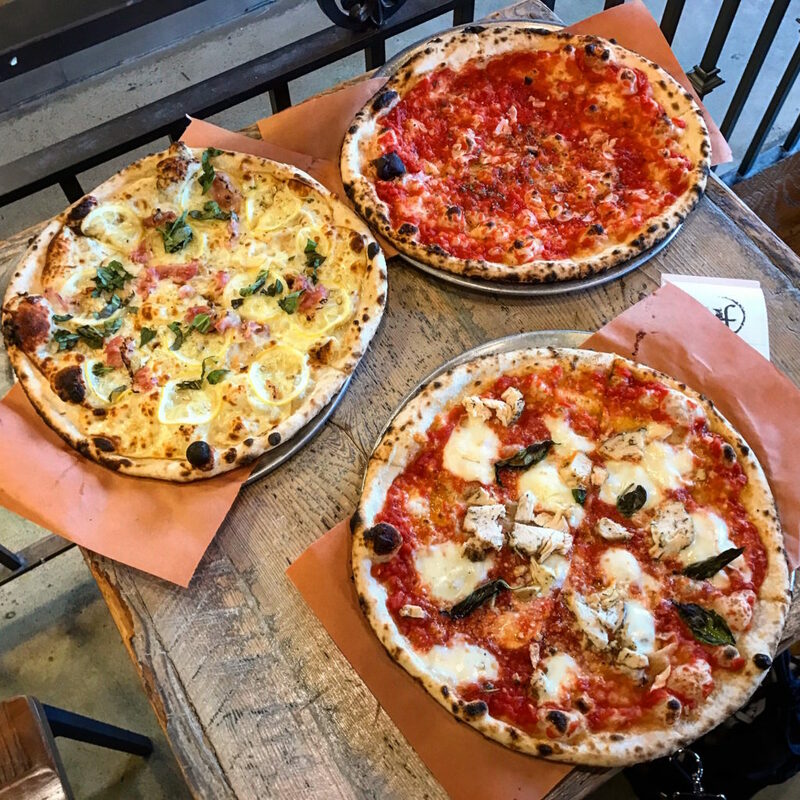 Neapolitan pizzas from Urban Fire in Madison, NJ. 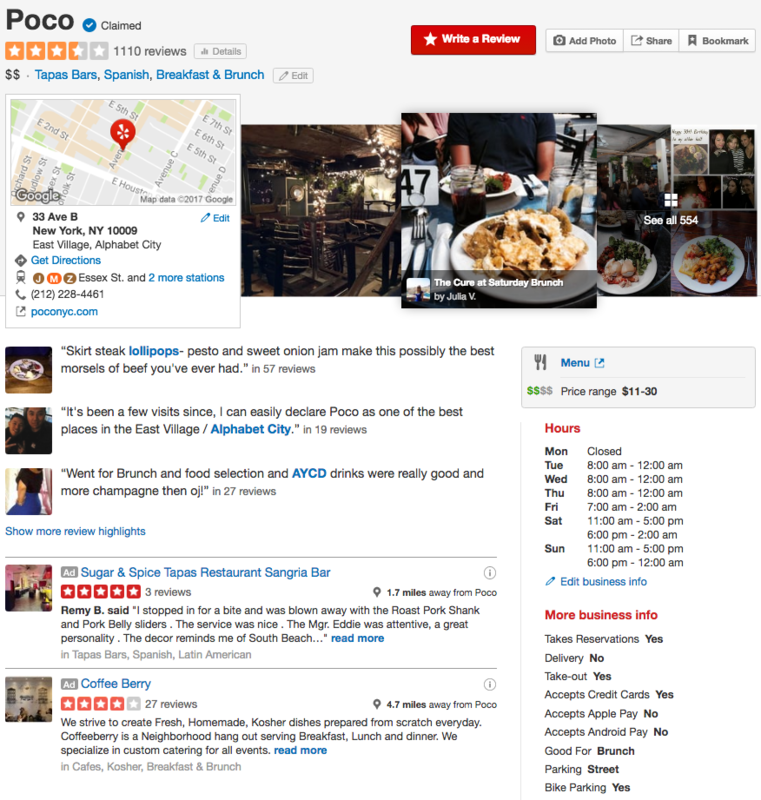 Why should you optimize your Yelp page? On going management of a Yelp profile (or any review site for that matter) is a job that requires time, a lot of patience and a huge slice of humble pie. But optimizing your Yelp page doesn’t really take a long time and the benefits are incredibly important. Yelp is one of the key websites that the search engines look to for information on brick and mortar businesses. It is a central hub of data for the key bits of details that people are interested in when searching and qualifying a business to fit their needs. Information like the hours of operation, your phone number and menu play an important role in local search for your business. 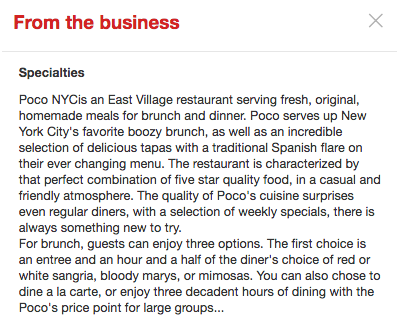 Check out the Poco – NYC page if you want to see what a full optimized Yelp for business page looks like. If you want to learn more about local search and SEO, read this article. You won’t be able to claim or manage your business page if you don’t first create a personal profile. It only takes a couple minutes. Make sure you include a nice photo of yourself for the profile picture. This will come into play later. Before you can update your data and other key informational points on Yelp, you’ll need to have control of your business page. This is the longest part of the process but from here on out, it’s very easy, smooth sailing. Click here for instructions from Yelp on how to claim your business page. It’s best that you do this while you are inside the business and have the ability to answer the public phone number for the business. They need to call to verify you are the owner. If at any point the process becomes confusing or overwhelming, you can call Yelp (877-767-9357) and they will help walk you through the process. One of the biggest problems with local SEO for brick and mortar businesses is inconsistent data across networks. The biggest culprit is the name of business. It’s quite common for a business with apostrophes, words that can be abbreviated, numbers, multiple words, ampersands, possessives and more to have difference in listings on different networks. Example: Boston Burger Company vs Boston Burger Co. Either way, looks pretty good to me! Now that’s a stack to drool over.?? Address / Map Marker – Here is where it starts to get fast and easy. Make sure your address is correct in the listing. If you have a word in your address that can be abbreviated like “Avenue” to “Ave” or can be listed two ways like “3rd Street” or “Third Street,” make sure you list it the same way on Yelp as you would your website … and then every other network. Hours of operation – If you don’t include your the hours that your business is open for operation, Yelp (and other websites) will update it on their own based on search data … even if that data is wrong! Customers can also make suggestions to your hours. It’s better if you just start by listing the correct hours of operation for each day of the week that you are open for business. Bonus: Include you holiday hours of operation. If you are closed on July 4th, add that in. If you open on New Years Day for those looking to “shake it off,” be sure to update that section. Yelp allows you to use key words to differentiate your business from others. It’s also very important for search data for people on and off Yelp. If you are a Burger restaurant that also serves salads or pizza (in my dreams! ), then use both “Burgers” & “Salads” or “Pizzeria” as your categories. Ideally you should use at least 3 categories. 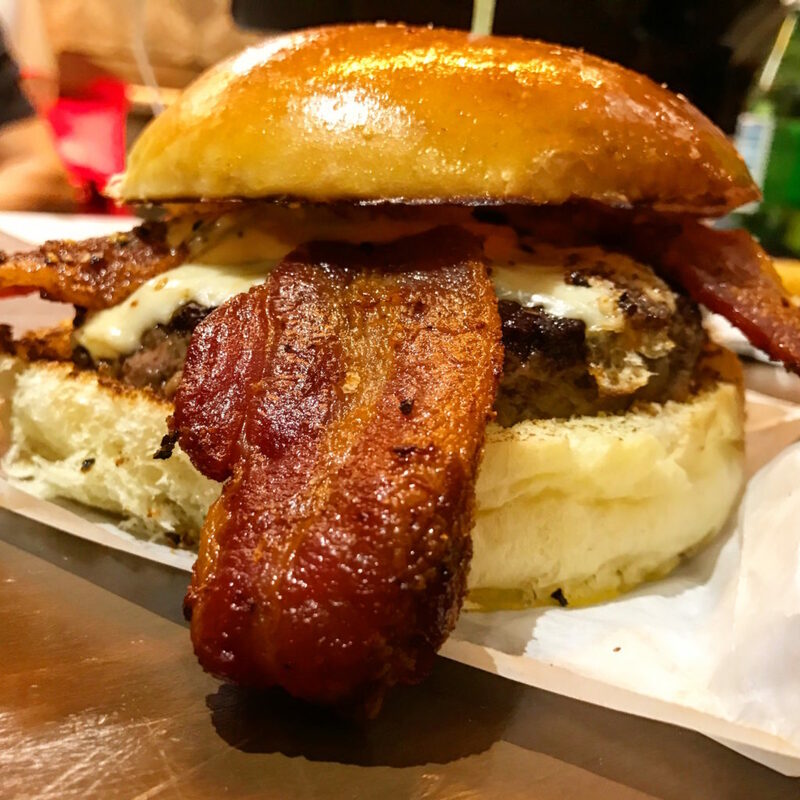 $$$ Bacon Burger from Burger, Inc. NYC – Daily grounded Angus beef cheeseburger, applewood smoke bacon, house sauce, brioche bun. Poco – NYC is a primarily a Spanish style tapas restaurant but is also well know for their brunch so they can use both of those. Are you a steak house with an extensive cocktail program? Use both categories. Nothing sells a restaurant business with decent to great ratings like incredible photos. You should up load no less than 3 pictures to your Yelp profile. I would suggest 2 stunning food photos, one of which should be a signature dish. The other photo should be of either the store front of the business or a picture of people enjoying themselves and or food in your establishment. Feel free to add 5, 10, 25 or more, but do not put less than 3. 3 is the default photo view on the profile page of a business. You’re on this website and you’ve read this far so I assume you are in it to win it. If you really want to crush the optimization side of your Yelp profile here are some additional things you can add to your profile. Doing these will truly put you ahead of the game. Specialties – Are you known for one particular dish or cocktail? Maybe its for your comedy nights or for being dog-friendly. Whatever it is that gets people talking about your business, add it to the specialities section. Meet the Business Owner – When people walk into a business, especially a bar or restaurant, they want to be treated like Norm from Cheers. Friendly greeting, automatically offered their food / drink of choice and an on going tab that never has to be paid. 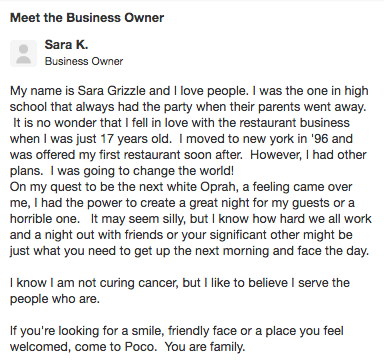 Yelp can’t do that for you, but it can turn you into Sam Malone, the friendly face behind the business. Update you the Meet the Business Owner section of your Yelp profile and tell your customers a little more about you, why you got into the business and what interests you have outside of the business. It will personalize you and make people feel more at home. When they see you in the bar, they will be more likely to say hi or even “thank you,” and you can start to build a relationship with them. Optimizing your Yelp for business page is easy to do and worth it alone for the local search benefits. This entry was posted in Burgers, Location Data, Marketing, Yelp and tagged "poco nyc", burger conquest, burger inc nyc, claim your business page, local search, location data, optimize, ratings, rev ciancio, reviews, urban fire pizza, yelp. Bookmark the permalink.